In today's data-fueled world, organizations are increasingly looking to the cloud for analytics to help accelerate time-to-value, spin up resources at will, and reduce financial risk while enabling in-house talent to focus on value-add. Tune in to this exciting webcast to hear three cloud experts – an architect, an advocate, and an evangelist – engage in a lively, free-flowing conversation about the many considerations when moving analytics into the cloud. One thing's for sure: you'll pick up new knowledge and get a fun, fresh perspective on one of the hottest topics of our era. Are you currently in your own analytics battle? Join Tom Davenport, IIA Co-founder and Bill Franks, IIA CAO as they share stories of four organizations successfully implemented the DELTA framework into their company. Tom and Bill share insights into the challenges they faced and what the teams did to overcome them. • How was the measurement made in determining when/if to push managers out if they didn’t transition to a data-centric style? • How do you educate non "analytical-savvy" senior managers and directors? • What is best strategy to build Analytical Culture in a very low analytical maturity organization? • How do we assess the pitfalls of cloud computing and analytics? • What’s the best way to vet a data scientist to avoid a lot of wasted time, money, and damage to the in-house advanced analytics initiative? Your organization has started to adopt and evolve to encompass the DELTA model and has focused on driving those changes. Now it's time to focus on the DELTA Plus model; this is when Technology and Analysis start to create measurable impact within a company. 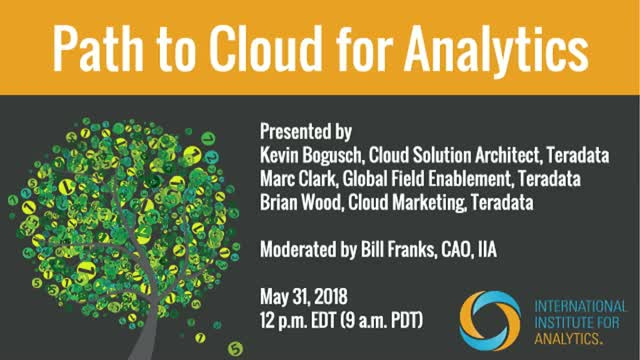 Join Bill Franks, CAO of IIA, and David Alles, VP of IIA, as they share how Technology and Analysis of the DELTA Plus model of analytics maturity will drive a greater impact in your company's analytics efforts. n this webinar, Executive Director Kathy Koontz walks through how analytics maturity plays into the internal cultural shift that needs to happen to allow analytics to have a real impact. As your organization moves farther away from the IT mindset, analytics change from a tool to a system. Understanding analytics maturity and how that builds the system in which allows people to make decisions is key for driving analytics impact. Join IIA as we host Edward Vandenberg, subject matter specialist in analytics and AI for the P&C Industry. In this webinar, you will go through the journey of analytics decision-making and find new ways of facing analytics problems. Edward shares his insights on navigating through key analytic challenges. As we close 2018 and start examining what 2019 will hold for the analytics industry, there are some key opportunities and challenges to look out for. IIA Chief Analytics Officer Bill Franks, Co-Founder Tom Davenport, and Research Advisor Bob Morison share the top predictions and priorities for 2019 in this exclusive IIA webinar. Join IIA Co-Founder Tom Davenport as he shares valuable insights from his newest book, The AI Advantage. In this webinar, he discusses leading case studies and top strategies to make the most of AI implementation. Digital footprints of consumers and businesses generate valuable alternative data that can be leveraged for deep insights into their behavior. Are you making the most of your alternative data? We at IIA delivered our first Analytics Maturity Assessment (AMA) in March 2014. Over the last five years we have seen some key trends across all industries. Join David Alles, VP of IIA, and Jack Phillips, CEO of IIA, as they talk through the top frameworks, insights, and learnings from the last five years of assessments and research. Are you working to harness the power of digital technology to enhance existing customer value, discover new market opportunities, manage risk, and improve operational efficiency? At the heart of digital transformation is data. New digital technologies are generating mountains of new data that is captured by organizations. However, without analytics, this data provides little or no value. This webinar will explore the five key ways analytics power digital transformation inside organizations. Based on IIA's new and updated research on organizing analytics teams, Research Advisor Bob Morison will review the objectives and variables of organizational structure and share examples of how enterprises are adjusting their structures to deploy and develop analysts effectively, incorporate new methods and technologies, address strategic business opportunities, and leverage the analytics ecosystem. In this webinar, Bill Franks will cut through the hype surrounding artificial intelligence (AI) to help the audience better understand what they need to know about the state of AI today. He will share examples of AI in action and the value it can drive, what AI can and can't do today, how AI differs from (and is similar to) other analytics approaches, tips on getting started, and perspectives on the future of AI. The aim of this webinar is to be both educational and thought-provoking. Analytics can mean different things to different people depending on their background, perspective, and organizational context and culture. For example, for some, analytics serves as the underpinning of organization strategy and innovation, while others treat analytics as an alchemy yet to be fully understood. Regardless of where you are in your analytics journey, there are a number of best practices that help frame the discussion of analytics value and position an organization for success. In this presentation, we will talk about the five best practice areas of analytics and the importance of design thinking as a tool to help us design and deliver analytic products and services that create value for organizations. More ML, AI, Data Lakes, and Data Viz alone is probably not going to delight your customers or enable your business to maximize the power of analytics. Brian O’Neill (Designing for Analytics) will help business and technology leaders learn how strategic product design and design thinking have a direct impact on turning data into actionable, indispensable insights and enable business objectives to be met. While there are many great data visualization and UI resources available today, this webinar is more focused on the topic of holistic user experience and the role that design plays in enabling delightful end-to-end analytics experiences that also deliver on the bottom line. A free Self-Assessment Guide will be provided at the end of the webinar so that participants can evaluate current projects against the design techniques and topics discussed in the webinar. Southwest Airlines is leveraging a growing team of analytics professionals, ample data, and state-of-the-art methodologies and technologies to create and sustain a strategic competitive advantage. In this webinar, Enterprise Data & Analytics Director, Doug Gray will address Southwest’s journey to date as well as future plans for the use of analytics, and highlight the organizational models, methodologies, techniques, and technologies being utilized. Two award-winning solution case studies will be highlighted: Fuel Supply Chain Optimization & Irregular Ops Recovery Optimization. UPS has gone through a long evolution in moving up the analytical hierarchy, which required organizational commitment and significant process change. UPS has seen a reduction of 185 million miles driven per year by integrating analytics within its operations’ systems. Its award-winning dispatch optimization tool ORION (On Road Integrated Optimization and Navigation) completed deployment in 2016 and is saving $300M to $400M annually. In this webinar, Jack Levis will share his experiences and best practices to compete with analytics, requiring organizational support in the form of data, tools, and senior management commitment. Given the recent demand for data analytics and data science skills, adequately testing and qualifying candidates can be a daunting task. Interviewing hundreds of individuals of varying experience and skill levels requires a standardized approach. In this webinar, Tanya Cashorali explores strategies, best practices, and deceptively simple interviewing techniques for data analytics and data science candidates. This webinar series highlights important concepts, techniques and strategies in the world of big data and business analytics. We tap into our unbiased network of analytics practitioners and thought-leaders to tackle real issues at the intersection of business and analytics.